How to Cut Electric Costs this Summer. 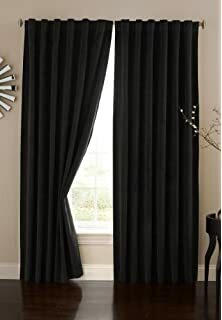 Thermal Control Blackout Curtains: These range from $10 to $14 per curtain but they are so worth it! I did an experiment in my home. I placed regular decorative curtains in the guest room and I placed the thermal control blackout curtains in the master bedroom. First thing I noticed was I slept in two hours too late. Unfortunately, I felt it was still dark outside and did not feel the need to get up. Luckily, I still made it to work on time. The second thing I noticed the guest bedroom felt much warmer than the master bedroom around 12:00 in the afternoon. I have recently placed thermal curtains throughout my home. My home is cooler and so is my bill. Fans: You may believe that your electric bill will be higher if you use a fan. Your electric bill maybe slightly higher but it is still a relatively inexpensive way too cool your home. Consider conserving energy in other ways to make up for the price difference. You can use less lighting around the house during the summer. Using a fan also provides flexibility of use. You can move it room to room when needed. Ceiling fans are also great to have. Last year, we were setting our thermostat at 67 all summer. We realized that our electric bill was unusually higher and we could not afford to keep the thermostat at 67. The thermostat was adjusted to 71. With the thermostat at 71 and the use of the ceiling fans, we were able to keep our home cool and have a lower electric bill. Check Your Windows and Doors: Check around your home for leaky windows or doors. Missing or damaged weather stripping or caulk can be a contributing factor for letting more heat in and more cool air out. Replacing weather stripping or caulk is inexpensive. You will have a noticeable difference in your electric bill after getting those items fixed. The weather stripping on our front door was bad and once we replaced it there was no light coming through the bottom and no warm air on your toes when you stood next to the door. We saw a considerable amount of savings between our electric bills from last year and this year. Our electric bill during the summer of 2015 was roughly $180-$200. Our electric bill for this summer, so far, has been $115-$130. The money saved from your electric bill is better used for home improvements. Enjoy your summer and stay cool! So true. I know of two doors in our house that could use new weather stripping. The quicker I get it fixed, the better. Thanks Caitlin.